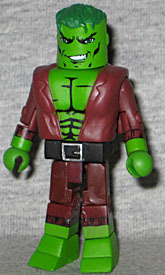 One of the Hulk's more stable incarnations, the Professor Hulk personality was created by Doc Samson in an attempt to balance Bruce Banner's fractured psyche. The "big-ification" of Minimates that began last series continues here. 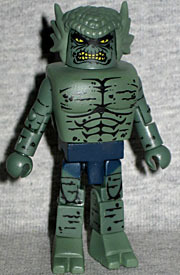 When this figure was released, he was the biggest Hulk Minimate there had ever been. In addition to his new chest cap, sculpted with lapels for his shirt and bulging muscles for his chest, he has an extra-thick belt/waist piece, a fully sculpted head (ie, the hair is part of it) and was the first figure to come with the two-level "duck feet" that Rustin is always complaining about. The paint is nice, with details on his cuffs, outlined muscles and a lopsided smile that shows a lot of character. Emil Blonsky exposed himself to even higher levels of gamma radiation than the Hulk encountered, resulting in his permanent grotesque appearance and an appetite for destruction. It simply wouldn't do for Abomination to be smaller than Hulk, so he also gets the big waist, huge chest cap and new feet - his feet have two individual toes rather than being smooth like Hulk's. The legs, arms and chest have a lot of paint details to make him look scaly and wrinkled, but the paint stops around the sides. Sometimes that's okay, but when the sides are as large as they are here, the bare areas stand out. His head is topped by a new pieces that gives us his ears and his lumpy head. 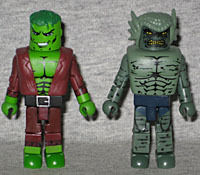 The set includes normal feet for both Hulk and Abomination, but they look worse with them than with the duck feet. This entry was posted in Art Asylum, Marvel, MMMR and tagged Hulk, Minimates. Bookmark the permalink.